Photos taken at Rangiroa, French Polynesia, an atoll roughly 200 miles NE of Tahiti. I stayed at Hotel Kia Ora, and dove with Top Dive. All underwater photos were taken with a Canon 5D Mark II (21 megapixels) inside an Aquatica housing with dual Inon Z-240 strobes. You can also see a few short unedited HD video clips from the trip, including part of a drift dive, shot with this camera at http://vimeo.com/bruceyates/videos . 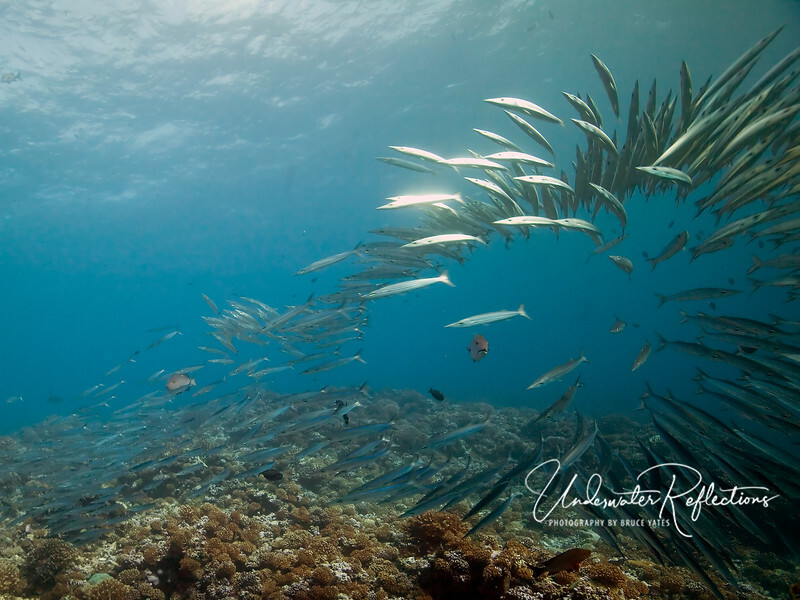 A school of small barracuda (1ft long) scatters to create an opening. If you look closely, you can see the reason; a black snapper in the center of the opening. As is true in most of the animal kingdom, any creature larger than oneself is considered a likely predator, so - even though the snapper is unlikely to go after the barracuda - they still give it a wide berth. Copyright Underwater Reflections. All profits from purchases on this site are donated.